In wastewater treatment plants, a variety of processes are employed to eliminate organic pollutants from water to ensure it meets sanitary requirements for future use. One of the most common processes is the activated sludge method, which biologically treats the wastewater through the use of large aeration basins. This process requires the pumping of compressed air into the aeration basins where a diffuser system ensures the air is distributed evenly for optimum treatment. 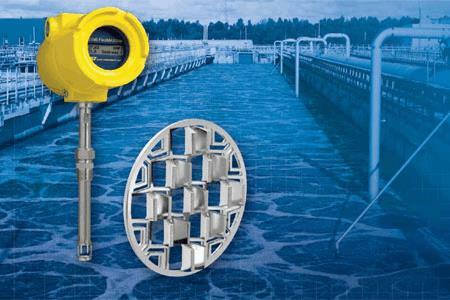 The energy needed to provide compressed air is a significant cost in the operation of a wastewater treatment plant. Tiny micro-organisms in the aeration basins decompose biologically degradable organic solids in the wastewater. These micro-organisms depend on the aeration system to provide the right amount of air necessary for them to thrive and consume the suspended solids in the wastewater. These solids are eventually removed downstream of the aeration basin and can be digested to create energy at the plant. Large amounts of air are required to ensure the aeration process operates effectively to treat the wastewater adequately before it can be moved along to clarifying basins, filtering, disinfection, and other treatment processes. Controlling the proper amount of air that is released into the aeration basins is essential since the air flow controls the growth of micro-organisms that treat the wastewater. Flow meters are typically installed in the aeration system piping to measure the amount of air flow, with their analog or digital output connected to the facility’s control system.